Plants have been used for medicinal purposes for thousands of years, perhaps existing even prior to humankind. There is evidence of schools of herbalists in ancient Egypt dating as far back as 3,000 B.C. Plants have been fundamental not only for medicinal purposes but also for culinary and cosmetic uses. They are so essential in fact that we probably would not have survived without them. Interestingly enough, “herbal medicine ” or more precisely “botanical medicine”, including not just herbs but also trees and shrubs, was in reality the precursor to today’s pharmaceuticals. The major difference is that herbalism when used properly is much safer and gentler on our body than pharmaceutical drugs as they do not cause side effects. All living things have “vital energy”. The vital energy of a plant is found within its different parts depending on the seasons. In the spring it is within the new leaves and buds while during the summer within the fruit and blossoms. In the fall and winter the vital energy moves to the roots. Harvesting for medicinal purposes must follow these seasonal guidelines in order to produce the herbal remedies. Eliminating & Detoxifying – laxatives, diuretics, diaphoretics and blood purifiers. 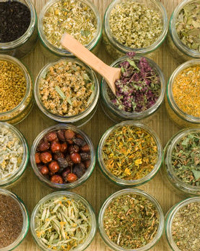 Maintaining – herbs that counteract physical symptoms allowing the body to heal itself. Building – herbs that tone the organs. The first stage is usually to eliminate, removing the toxins that are both a physical cause and a result of the disease. Garlic -Allium Sativum – containing allicin the active constituent that has been scientifically proven to lower blood serum cholesterol levels. Purple Coneflower – Echinacea purpurea – containing echinacin the active constituent that has been proven to show evidence of interferon-like activity protecting cells against viruses such as influenza and canker sores. Goldenseal root – Hydrastis Canadensis –its active constituents include hydrastine and berberine both known as effective antibiotics and vasoconstrictors. Remember that in the end, all healing comes from within and the body heals itself. Even natural remedies may be inappropriate if they are not accompanied by a positive attitude of wellness. Lao Tzu in the Tao Te Ching wrote, “A person will get well when he is tired of being sick”. Every herb contains hundreds of biochemical constituents that may affect the body. It is always recommended to consult with your primary healthcare practitioner to check for any contraindications and for any drug interactions prior to taking herbs.